Here is an example of HTML5 documents we can create. HTML page starts with HTML5 doctype followed by the page title and content of the webpage. For content we are using a heading element and paragraph element etc. Now let’s see our first program of HTML. <!DOCTYPE html> defines the html5 version. <html> element is a root element of the HTML page. <head> element defines the Meta information of the webpage. 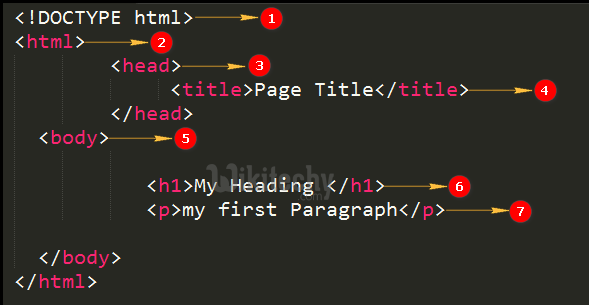 <title> element is termed as the page title of the HTML page. <h1> element is termed as the heading of HTML page is given as “Welcome to Wikitechy”. <p> element has the name of the paragraph is given as “this is my first paragraph”.